What if completing a post-op appointment was as simple as making a FaceTime call? Or powerful AI could sort through medical histories in a fraction of a second to accelerate routine diagnoses? As advances in telemedicine, or telehealth, continue, seeing these “what ifs” become a reality is only a matter of time. 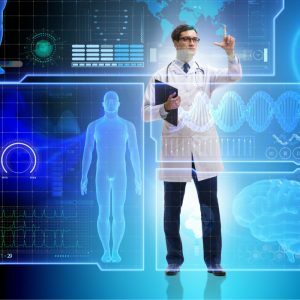 Major breakthroughs in machine learning, blockchain networks, big data and predictive modeling have already made their mark on healthcare. As these technologies become more commonplace, they have the potential to reshape the industry and the patient experience as a whole. For healthcare organizations and providers, the question then becomes, what does the future of health look like? Better yet, how does your organization fit into that future? Making up about one-fourth of the healthcare technology market, telehealth has become more accessible than ever for both patients seeking care and providers implementing these services. Showing no signs of slowing down, the widespread adoption of telehealth marks a fork in the road for many healthcare organizations—jump on board or fall behind. But even a decision to stay on or ahead of the curve carries its own set of implications, including the need to invest in technology, understanding the new competitive set, and shifting patient and promotional communications towards digital. Implementation costs are often the biggest barrier to entry for healthcare organizations looking to offer telemedicine services. But there are options and the level of investment may vary from one practice to the next. On the higher end of the investment scale, organizations with larger budgets may choose to launch a proprietary application to connect providers and patients across the country. This method offers complete control over branding, staffing, training and processes. It also calls for more work up front, from planning and strategy through app design, development and launch. Plus, you’ll need the resources to keep your program running smoothly, including nights and weekends if your organization offers around-the-clock care. As an alternative, practices can hire a third-party service to manage virtual visits or partner with regional health systems to tag-team offerings. These options can range from platforms your specialists can use to “see” patients at remote sites, to turnkey systems where the entire process, including staffing, is handled by the service. In either direction, or a combination of both, breaking into the telemedicine space means investing in the necessary resources. And implementation is not a one-and-done process. Telemedicine is an always-changing, fast-growing sector of the healthcare industry, which means providers must work to stay up to date with advances, regulation changes and emerging technologies. Technology has made the world feel like a smaller place. With telemedicine, patients in rural areas without convenient access to healthcare can connect with a physician across the country. And while that means better care and greater access, it also means more competition for providers and healthcare organizations. 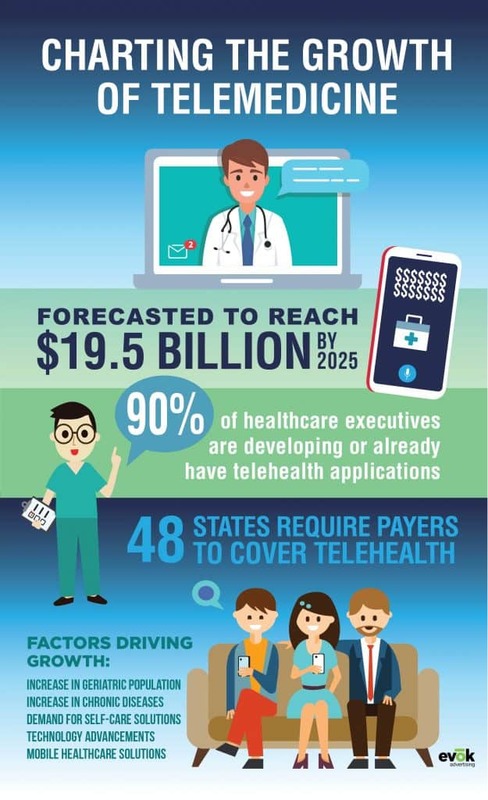 While telehealth means better care and greater access, it also means more competition for providers and healthcare organizations. Medical practices are no longer only competing against other local providers. That competitive set has now expanded to a regional, if not, national level. A patient needing to see a specialist can choose to virtually visit one a thousand miles away, rather than waiting for an appointment at their local office. Telehealth visits also tend to carry a lower cost for patients, which may sway their decision away from in-person appointments. Competing in this saturated market means getting to the root of your organization’s unique qualities—what do you have to offer that no one else does? The answer to that question will help guide your marketing efforts to position your practice as the right choice for patients prioritizing those qualities. Although telemedicine can make the market more competitive, it can also offer a competitive edge. For family practices or local physicians’ offices, offering virtual visits is a way to compete with larger clinics, as well as retail health clinics and concierge medical services. Patients are searching for non-traditional ways to obtain healthcare, and telehealth allows practices to market themselves as a viable option. Patients in a waiting or exam room represent a captive audience. During a visit, posters, brochures and other reading materials are all but unavoidable, making your organization’s office prime real estate for promoting new products, services and special offers. Telehealth changes that. As telemedicine continues to pick up market share, office visits may decrease in frequency or even stop completely for some patients. That means organizations must find unique ways to reach patients beyond office locations, staying in touch in between visits to share news or updates, as well as drive appointments, whether they are in person or online. Many organizations have already tapped into digital media to manage patient and promotional communications. It’s a simple, convenient and often affordable way to keep exchange lines open, whether it’s through a text reminding a patient of their upcoming appointment or a monthly email newsletter. This, however, is only a small sliver of the capabilities healthcare providers and marketers have at their fingertips. With healthcare being an inherently personal area, a shift towards digital may seem counterintuitive. But advanced targeting and audience segmentation makes sending personalized communications, even through mass digital media, possible. This can help bridge the gap between the personal nature of healthcare and the broad reach of the digital scape. Technology — Is your practice in line with the latest developments in telehealth? Do you offer patients easy, convenient access to care anywhere they are? Adaptability – What are your patients looking for in terms of virtual care? How can your practice answer those needs? Functionality – Is your organization’s telehealth platform easy and convenient to use? Are your electric medical record (EMR) systems integrated with telemedicine? While the future of healthcare is uncertain, the actions we take today will help shape the fate of the entire industry. This leaves only one question to be asked—what part will you play?